President Trump's Top Economic Adviser ... Money Tips For NFL Draft Picks! If Kyler Murray is thinking about using his first NFL paycheck to buy some crazy jewelry ... IT'S NOT A TERRIBLE IDEA!!! ... this according to Donald Trump's chief economic adviser, Larry Kudlow. Kudlow -- the director of the National Economic Council -- was in D.C. when we asked if he could dish out some financial advice for the football stars about to become millionaires when the NFL Draft kicks off on Thursday night. Of course, Kudlow encouraged all of the players to get good financial advisers and invest ... but he also got SPECIFIC about where the players should put their money! "Buy the indexes and hold them," Kudlow said. "Buy the broad indexes! They're cheap ... don't buy a million, but buy SOME and hold them ... and bet on America!" As for the jewelry stuff ... Kudlow laughed at first, but then got serious and told us, "Actually, a good portfolio SHOULD have some gold!" See that, GET THAT BLING!!! We also asked Kudlow if Russell Wilson buying $12,000 in Amazon stock for all 13 of his Seattle Seahawks linemen is a good idea ... and you gotta hear Kudlow's response. Remember, Kudlow's boss, Donald Trump, HATES Amazon's top guy, Jeff Bezos -- which makes Kudlow's answer all the more interesting. Not everyone is a fan of Wilson's gift -- we spoke with actors Michael Ealy and Meagan Good ... and it's clear some people think Russ should have cut BIGGER checks, considering he just signed a $140 MILLION contract. But hey, a gift is a gift ... right? Van Jones is working hard to bring light to prison reform and start a national conversation about our criminal justice system ... but he says a few celebs are outshining him. We got the CNN host at Chelsea Studios in NYC Tuesday and asked who he thinks is stepping up the most for the cause ... he points to Meek Mill, calling him a "massive hero" for using his own case as a launching pad to help others. Van then praises Kim Kardashian West for ignoring the skeptics and proving her ambitions and involvement are no joke ... and he believes it's a sign people from all walks of life have realized we have way too many prisoners in the U.S.
T.I. also gets a major shout-out for working with a church in Georgia to raise $120k to bail out 23 nonviolent offenders for Easter. Van says the rapper's "doing good by the hood," and if more people followed his lead ... things would improve very quickly. Lil Dicky Hard to Nail Down Kanye for Cameos ... But He's in Good Company!!! Lil Dicky's got a lot of love for Kanye West -- calls him his "hero" -- but that wasn't enough to get him on the horn to play himself in Dicky's epic "Earth" music video. We got the rapper out Monday in NYC, and asked him why the role of Ye had to be played by Kevin Hart. Tons of other celebs lent their voices to animal characters in the vid -- Justin Bieber is a baboon, Ariana Grande a zebra, Halsey a lion cub, Adam Levine a group of vultures, Wiz Khalifa a skunk, and so on. No animal treatment for animated Kanye though. Leonardo DiCaprio played himself and wasn't an animal, but Dicky credits him for helping him take the passion project to the next level. Not so for Kanye, but Dicky told us why he still had to include him in the video. BTW, there's another cameo he didn't get for "Earth," but he's holding out "hope" he can make that collab happen in the future. Yes, "hope" is a hint. Dicky told Rolling Stone he waited until the video was nearly complete so Kanye would be the last one to see it -- but eventually, he just ran out of time, and couldn't wait on Ye. Still an awesome video, even without him. BTW ... we got Denis Hayes out in D.C. -- the environmental advocate who co-founded Earth Day, which we all celebrated Monday (right?). We asked Denis if he thinks President Trump will pay attention to climate change with celebs getting more and more involved. Hayes had strong feelings about that. 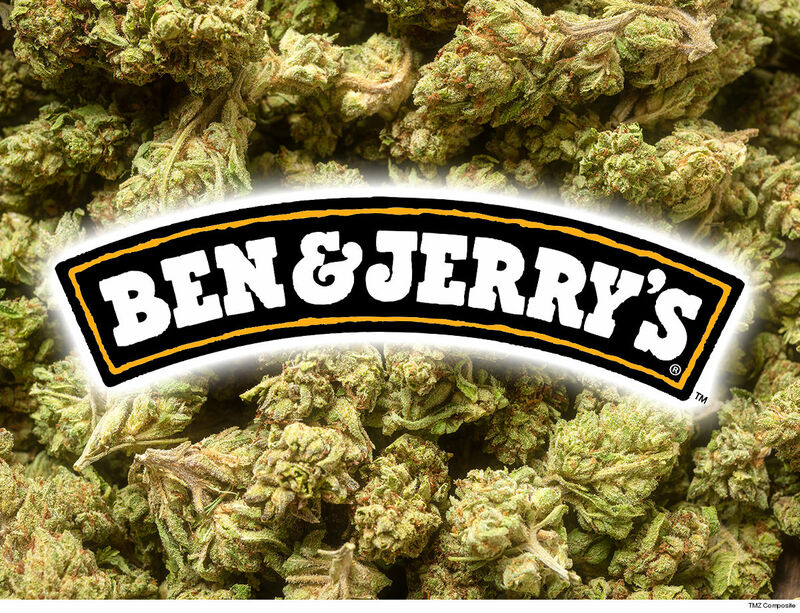 Ben & Jerry's got blunt on 4/20 by going to battle for the disproportionate amount of minorities getting the shaft when it comes to weed busts. Check out the video ... the company wants to celebrate the holiest of holidays for stoners, but while also making sure legalization doesn't leave people of color behind. It also calls on the judicial system to expunge EVERYBODY'S weed convictions. BTW ... weed is legal in 33 states but, according to one study, black people in NYC are 8 times more likely to be arrested for weed than whites. Ben & Jerry's says that's NOT cool. Now that's a company that knows its audience. 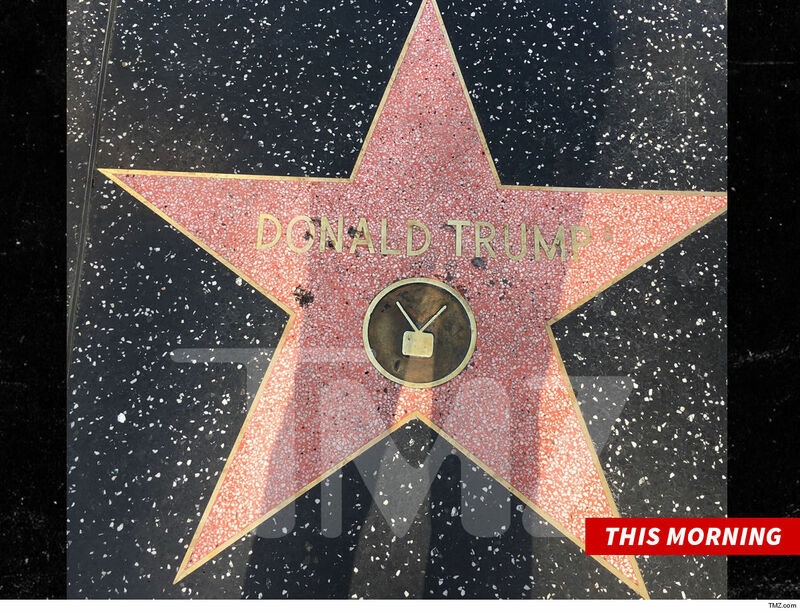 President Trump Seizing The Moment After Mueller Let's Raise $1 Million For My Campaign!!! President Trump ﻿is looking to cash in on the Mueller Report ... because he's asking his supporters to buck up for his re-election campaign and send a HUGE message to his haters. 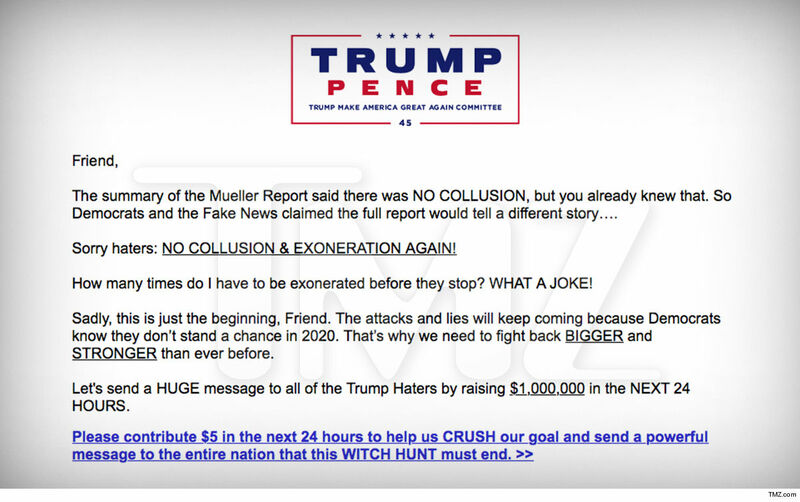 Trump's campaign sent an email Thursday to subscribers, hours after the Prez declared victory and total vindication over the Mueller Report, asking them to help raise a million bucks in 24 hours. Trump's campaign is taking tons of swipes at the Democrats and "Fake News" media ... asking how many times must he be exonerated before the attacks stop. We're guessing Trump's campaign staffers didn't read the Mueller Report, because Mueller said he could not exonerate the Prez. POTUS declared "Game Over" moments after Attorney General William Barr ﻿held a news conference saying Mueller found nothing on Trump ... but his campaign says this is just the beginning of the "attacks and lies" as the 2020 election nears. One message is absolutely clear ... Trump's campaign wants your money!!! 9:54 AM PT -- HBO has responded to Trump's tweet, saying, "Though we can understand the enthusiasm for 'Game of Thrones' now that the final season has arrived, we still prefer our intellectual property not be used for political purposes." 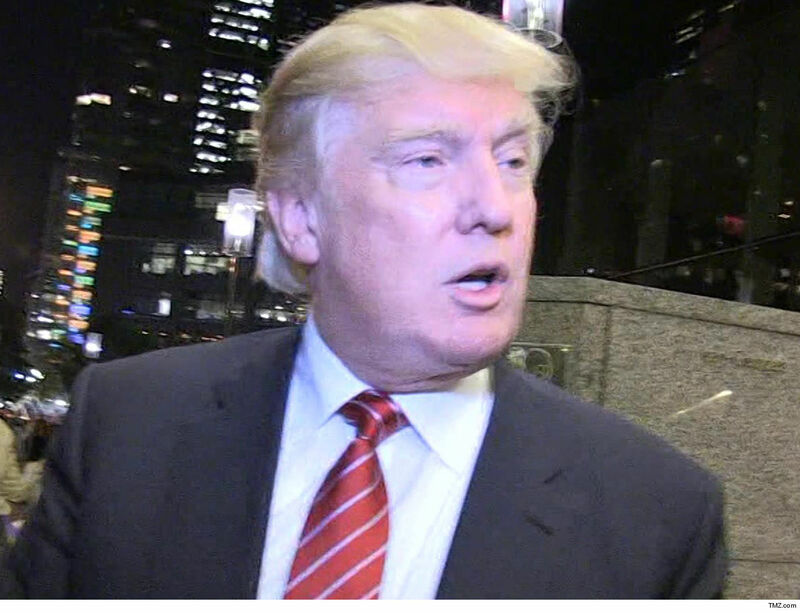 Jon Snow's got nothing on President Trump ... just ask 45, who's using "Game of Thrones" again to celebrate the release of the Mueller Report and what he considers total vindication. POTUS was on his Twitter game moments after Attorney General William Barr held a news conference to say Mueller found nothing on Trump. 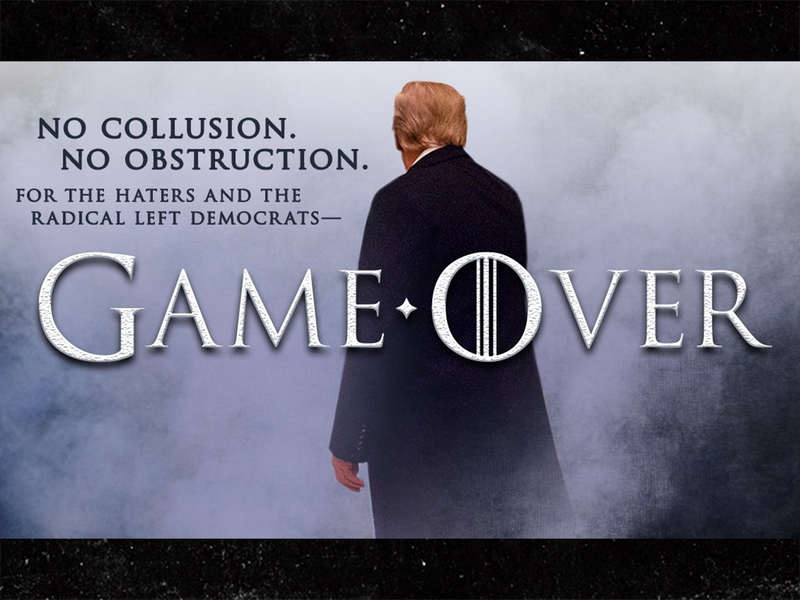 The Prez posted a 'GoT' styled meme, stating, "Game Over." 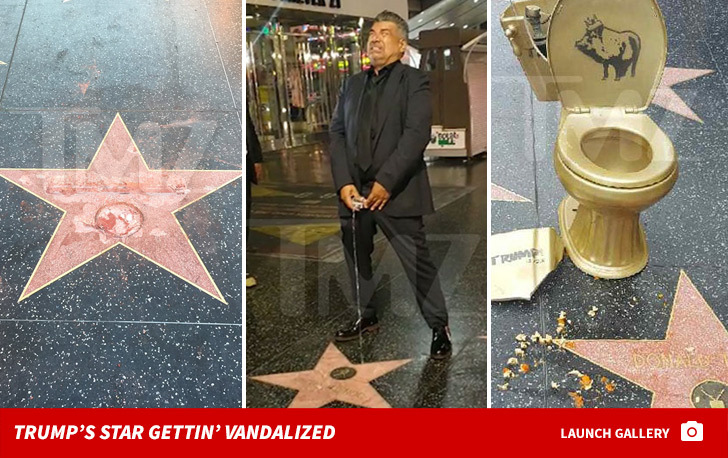 He included a pointed jab, "For the haters and the radical left Democrats." Trump was ripped by HBO when he did this same thing back in November to bark about imposing sanctions on Iran. 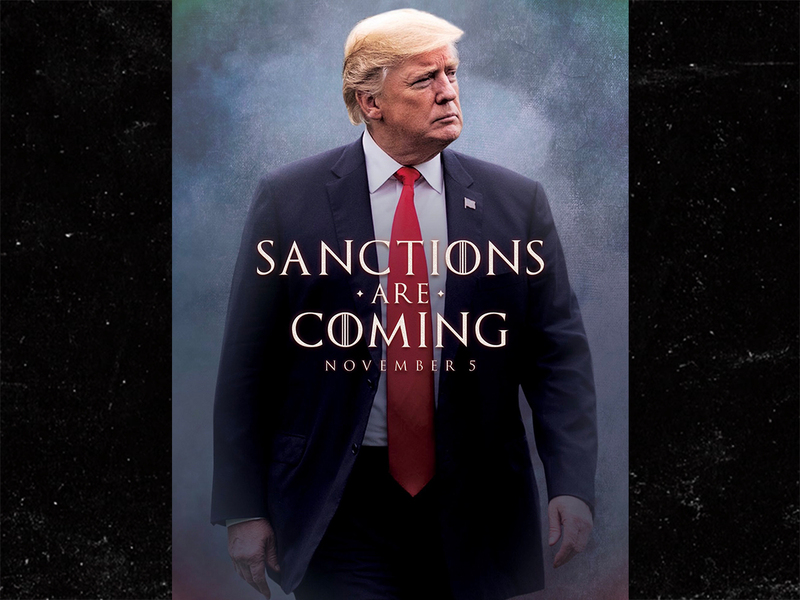 The cable network was pissed he ripped their font for his "Sanctions are Coming" meme. It's a good bet, Trump really doesn't give a crap what HBO thinks this morning (or any morning, for that matter) ... he's in victory lap mode. Fun Fact: "Game over" is also the calling card of Jigsaw from the "Saw" horror movies ... not that we're making any comparisons. We know Mayor Pete Buttigieg likes to rock out, and if he wins the presidency in 2020 ... sounds like he's down to jam for an extended amount of time after he's sworn in. Buttigieg was leaving NBC's 30 Rock in NYC Thursday morn when we asked who his dream performers would be at his inauguration ... seems he hasn't really thought about it too much. TBH, that IS a looooong ways down the road. Still, our guy makes a suggestion -- based on what we know about Pete's musical preferences -- and we're thinking it'll get some fans phired up. If the band's interested, Buttigieg is too. BTW -- Mayor Pete's been blasting some Phish tracks on the campaign trail ... including the deep cut "Tweezer - Reprise" from their 1992 album "A Picture of Nectar." It's a good jam. Speaking of the campaign, Buttigieg tells us he knows there are some folks out there who would never vote for him, purely because he's gay ... but he's still going to try to win them over. 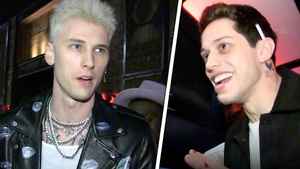 'ANTM' Star Miss J LGBTQ Fam Has Mayor Pete's Back ... I Hope He's Got Ours!!! J Alexander, aka Miss J, is ready to throw support behind Mayor Pete Buttigieg, but wants him to know the LGBTQ community expects his in return ... on every level, with no excuses. The "America's Next Top Model" coach was at the Strand Book Store in NYC Tuesday when he told us his thoughts on the rising star in the Democratic primary field, who happens to be openly gay. Miss J believes Pete's got what it takes to win votes -- even from anti-gay voters -- but strongly hopes he does it by continuing to be inclusive and do work on behalf of all LGBTQ folks. J even calls for his people to "band together" for the South Bend, Indiana mayor, because he believes if they get him in the White House ... real differences can be made. Meanwhile, Mayor Pete got a dose of homophobia Tuesday in Iowa from a couple of protesters, including one chanting "Remember Sodom and Gomorrah!" You'll recall Pete told us he was prepared to handle these sorts of attacks during the campaign, and he did just that. Miss J should be encouraged by how the situation played out -- Buttigieg's supporters shouted them down and Pete was unfazed ... simply reminding the crowd the Iowa caucuses are up to all of them.